Phomello LitePOS is the perfect solution for faster billing and customer service. Phomello LitePOS is indispensable in today’s retail and hospitality sectors. It is efficient, easy to use and versatile. 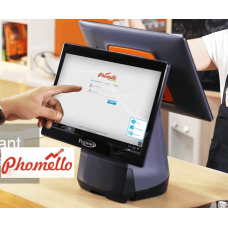 Developed by Pegasus, a pioneer company producing POS systems for a wide variety of sectors and applications since past decade, Phomello LitePOS is sure to make operating your business easier. From the small local restaurant to café’s, saloons and spa, from the local taxi service to an international travel agency , no matter what your business is, with Phomello LitePOS app you can have smart POS experience at your fingertips to simplify your day to day billing activities. Phomello LitePOS app provides a smart and intuitive invoicing solution. Instant tokens, fast billing, staff management, customized taxes on individual items (perfect POS solution for GST) and discount creation, all this can be easily accomplished with one system. LitePOS mobile friendly application is available on both the major mobile platforms i.e. iOS and android. The LitePOS app also support all major types of printers. Phomello LitePOS is available in two versions i.e. stand-alone and cloud. The cloud version makes it easy to create backup and store the data. Phomello LitePOS is a great solution for Small business owners and Kirana Shops. The lightweight and portable Phomello LitePOS device allows shop owners to manage Inventory, track sales, store vendor contacts and customer details, issue discounts, customize GST tax and email or print digital receipts efficiently. The easy to use Phomello LitePOS device has friendly user interface which minimizes training cost of staff members. Shop owners and Retail chains can also use the LitePOS system effortlessly by integrating it with their ERP and databases. Cloud back office helps to gain real-time information about inventory, stock levels and customer preferences. Provide a digital experience to your customers and gain their loyalty. Phomello LitePOS is sure to gain you more customers and better return on investment. Keeping in mind the current changes put forward by GST, Phomello LitePOS presents a cutting edge POS technology solution for the growth of restaurant business. Phomello LitePOS with features such as GST enabled billing, split check, happy hour pricing, inventory management, recipe management, customer & vendor contact management, menu engineering, discount management and report customization reduce the hassles of manual work and subsequent errors. Phomello LitePOS is ideal for any form of F&B business, be it a restaurant, cafe, bar, bakery, single food outlet or even a multi-chain, multick office makes management of enterprise sales and Inventory easier.